A nutritionist's tips to controlling cravings and eating healthy. 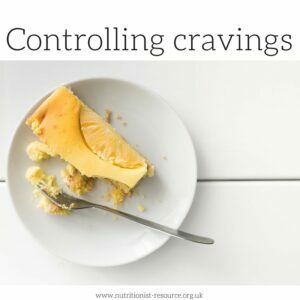 This week, Nutritionist Resource member and nutrition coach, Susan Hart shares her tips to managing cravings. Tip one: Try and get yourself outdoors. This will distract you from searching the kitchen cupboards for sweet treats. Take a bottle of water and some music or a book. Sitting outside will mean you will be getting some much needed vitamin D (remember to wear sunscreen!) and keeping the body moving will release some feel good hormones. Tip two: If chocolate is your thing, break up a bar of dark chocolate into squares. Place two squares (a portion) into freezer bags and freeze. When you feel the need for a sweet treat, get out a portion and let the chocolate slowly melt in your mouth. You will find that you will satisfy your cravings and the portions mean you won’t eat too much! Tip three: Similar to the chocolate, place grapes in the freezer. Frozen grapes make a delicious, sweet snack, perfect for summer. Tip four: When eating, take your time. Often when we comfort eat, we want to get it done as quickly as possible. But if you eat slowly, the chances are you will feel satisfied quicker, therefore eating less and consuming less calories. Tip five: If you are craving something sweet or savoury, you may be thirsty. Try and have a drink before eating as this may take away the craving. Water is the best option. Tip six: Comfort eating is often associated with habit. For example, a cup of tea with a biscuit, coffee and a cake, a trip to the cinema with a bucket of popcorn… If this sounds familiar, try and change that association. Instead of popcorn, eat before and order a coffee or take a bottle of water to the cinema. For your elevenses, have a cup of hot water with lemon and resist the biscuit. If you are meeting a friend for a catch-up, make a sandwich beforehand and skip the cake. Hunger is often the reason behind unhealthy decisions, so be prepared! Remember to enjoy everything in moderation. Restricting yourself can sometimes result in more cravings and eating too much. To take the first steps of your journey and learn more about healthy eating, visit our not sure where to start page.